Our story opens on a monastery where we’re witness to the dedication of their new master. Doctor Strange has had a hand in his selection, and we’re left to wonder why a pretty surfer boy was chosen. As things progress, a lowly monk interrupts the whole affair to warn them of the Indian government sending a garrison on troops to their holy temple. Surfer boy is exasperated, and a curse (even just the simple mention of it) has dire consequences. Meanwhile, back in the Village, the good Doctor is meditating on events both recent and past. The ladies of his life run through his mind, kept at arms’ length, in thought as well as heart. He believes his lack of love pushed him to dispel of the bonds his friend Darryl had been subject to, effectively killing him. Hard to say if love’s to blame but the sorcerer’s mind is elsewhere to be sure. Surfer boy’s thoughtless incantation spreads to the Indian defense minister speaking in front of the UN. The prime minister collapses on stage, a mouthful of war medals lodged in his mouth and throat! Doctor Strange heeds the call, and we see more backstory of the surgeon he once was. Standing guard, he dispels a minor demon, a lackey called a khat. Though Strange stops the continued proliferation of the prime minister, the khat decides to take out his revenge on the entire hospital. Strange finds that he can’t help all of these victims, almost doesn’t want to, and begins to have some hugely doubtful urges. The khat’s insistence his home and ensorcels the Doctor back to the demon’s realm. 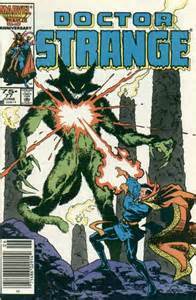 Here, it is deafening for Strange’s thoughts. His pessimism has taken control of him, the demon using it against him. Tearing at him, the khat punishing Strange until there is nothing left, until Strange realizes where he is weak, and in tandem, learning wherein lies his strength. Great storytelling, pacing and art. Enjoying these.